This enchanting activity game will keep younger kids happily distracted, whether it's played indoors or out. A cute, blue elephant blows 30 feathery, vinyl butterflies from its 4-foot trunk into the air. The trunk, made of flexible plastic, stands straight up when the small, quiet motor in the elephant's bottom is turned on. Kids use mesh nets (four included) to capture the most butterflies, same-color butterflies, or just catch 'em period. 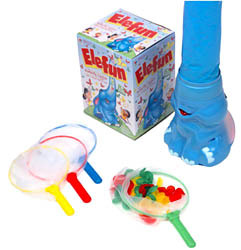 The object of the game is to catch as many of the butterflies blown out through Elefun's trunk.